For Sunbrella, an established value in the field of textiles suitable for the boat industry, INNI group developed a brochure that is as striking as Sunbrella’s own materials. Sunbrella textile is resistant to wind, water, scratches and salt. 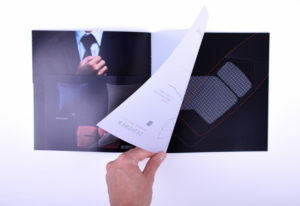 As a result, the brochure was also developed scratch-free, resistant to salt … we do not dare to claim that. Working with a scratch-free foil on the cover, inserts and lime paper give this small brochure a lot of character and look!